If you’ve never experienced Atlanta during the holiday season, you’re missing out. There are many exciting and festive events all around the city for both Atlanta natives and tourists to enjoy. We’ve compiled a list of some of the best holiday events throughout Atlanta. Check them out below! The Children’s Christmas Parade is a free annual event. 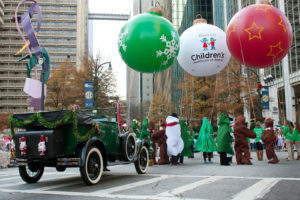 During this time, midtown Atlanta is transformed into Santa Claus Lane with floats, helium balloons and marching bands. Before the parade starts, there are two unique breakfast options to choose from: Breakfast with Santa and the Smiles of the Season Breakfast. Every day in December, Rudolph the Red-Nosed Reindeer™ will be performed at the Center for Puppetry Arts! With your admission to this live show, guests will also be able to attend a Create-A-Puppet Workshop™ and will receive admission to the Worlds of Puppetry Museum. Decatur Glassblowing will be hosting an ornament glassblowing class! Attendees to this class do not have to have previous glassblowing experience because the instructor will go over safety, tools and equipment. After the instruction and demonstration, each student will get to make their ornament. Attendees will get to choose between creating an ornament that hangs on the Christmas tree or one that can sit on a flat surface. Christmas with the Atlanta Symphony Orchestra is a beloved holiday tradition started many years ago. Performing alongside the Atlanta Symphony Orchestra will be the Gwinnett Young Singers and the Morehouse College Glee Club. Tickets for this event will be available online. This year let the Jingle Ball get you into the Christmas spirit! This star-studded concert features Shawn Mendes, Calvin Harris, G-Eazy, Marshmello, Bazzi, Alessia Cara and Sabrina Carpenter. Tickets for this event are available online. This year, take a stroll through decorated Atlanta historic houses and experience the beauty of Christmas past. Afterwards, visitors can shop at the Holiday Market where they can purchase local crafts, vintage holiday décor and creations from different artists. Are you looking for a storage facility near Atlanta, GA? Storage World has storage facilities in Jonesboro, GA and in Decatur, GA on Panthersville, RD and Flat Shoals Pkwy. A storage unit rental is a smart solution for storing seasonal decorations once the holidays are over. Storage World has various sized storage units, including the 5×5 storage unit, 5×10 storage unit and 10×10 storage unit. Reserve a storage unit for seasonal decorations today!